Boils are an infection of the skin. They are like pimples or steroids . The disease is manifested by boils under the skin. They cause a lot of pain and discomfort to the patient. It can disappear after 2 weeks or cause many complications. As a result, getting rid of them quickly is always something that every patient is interested in. 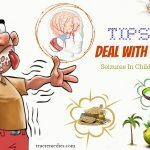 I know that the reason you are reading this article of 10 tips on how to get rid of boils fast is to learn how to treat this condition, but before that, you had better understand some basic information about it. By doing so, you can accurately determine your problem to choose the appropriate treatment. Boils is a skin infection.Boils are the condition in which the hair follicles are inflamed. They often cause deep sores on the skin. They contain pus and cause pain. Boils usually form in blocks. They are always swollen and red. They quickly grow bigger. That’s because more and more pus is inside them. This causes the patient to feel pain in the skin with boils. At some point, the boils will break and the pus will come out. There are two types of boils: common boil and carbuncle. Carbuncles usually occur at the back of the neck, shoulders or thighs. Carbuncles cause deeper and more serious infections than common boils. In addition, they develop slower than common boils and are likely to leave a scar. Normally, the skin has a number of bacterial species that do not cause disease. The body can react to the disease by itself. Boils are usually caused by staph. Poor body hygiene can cause itching. Too much scratching can cause scratches or dermatitis. As a result, the bacteria have favorable conditions to enter the body, causing some diseases including boils. If your health and immune system are good, your body can create a sheath for the lesion, creating a small boil. On the other hand, if your health is not good or if you break it too early, bacteria can enter the bloodstream, causing blood infections. If bacteria enter the bloodstream, they will spread throughout the body and can cause illness in any organ such as the lungs, heart, liver, and blood vessels. When these organs become infected, they can cause many dangerous complications, even life threatening. Many people find it difficult to distinguish between boils and acne. This makes the determination of treatment difficult. As you know, acne usually happens in puberty. It is a chronic condition. It also contains pus. However, boils can occur in anyone. Boil is not a chronic condition. It can go away on its own after about 2 weeks. In addition to containing pus, you may notice that the boil has a white mass in the middle. According to experts, boils are more dangerous than acne. What Are Common Causes Of Boils? Boils usually occur when the hair follicle is infected with Staphylococcus (commonly found on the skin and in the nose). Humid parts of the body such as the nose, mouth, back, thighs and armpits are susceptible to infection because the bacteria easily develop in these areas. The disease starts in the hair follicle and gradually develops into the skin layers. It can be spread to other people if they contact with the boils. Other skin problems such as acne and eczema can also cause boils. They destroy the protective layer of the skin which makes you prone to boil. In other cases, boils can also develop in damaged skin areas (small scratches or insect bites), which facilitate the entry of bacteria . In addition, lack of nutrition, wounds, poor hygiene, tight clothing, abrasions, or frequent contact with certain chemicals or cosmetics can also cause boils. Disorders such as diabetes or alcoholism can also increase the likelihood of developing a boil over due to a weakened immune system. If your immune system is compromised for any reason, this may increase your chances of developing a boil. Boils can cause folliculitis and turn worse if the body sweats too much. Excessive consumption of iodine may also be responsible for the boil. If the amount of salt and sugar is loaded too much into the body, boils may appear. What Are Common Symptoms Of Boils? Initially, the boil is just like a small bump with a diameter of about 1.5 to 5 cm. It makes you feel a little hurt. The surrounding skin may also be swollen. Boils usually appear in the neck, face, waist, groin, armpits and buttocks. Gradually, they will become larger. The bigger they are, the more pain you feel. Some boil may be deep in the skin, then slowly develop, causing bleeding which has blood and white fluid. After the boils are broken, the pain is lessened, but redness and swelling persist for days or even weeks, even leaving scarring. If not treated promptly, they may spread into the bloodstream and spread to other organs. Pus usually occurs within a day before the boil appears. As we said above, anyone can encounter this problem. The disease can occur in both men and women. However, boils usually occur in people who have gone through puberty. 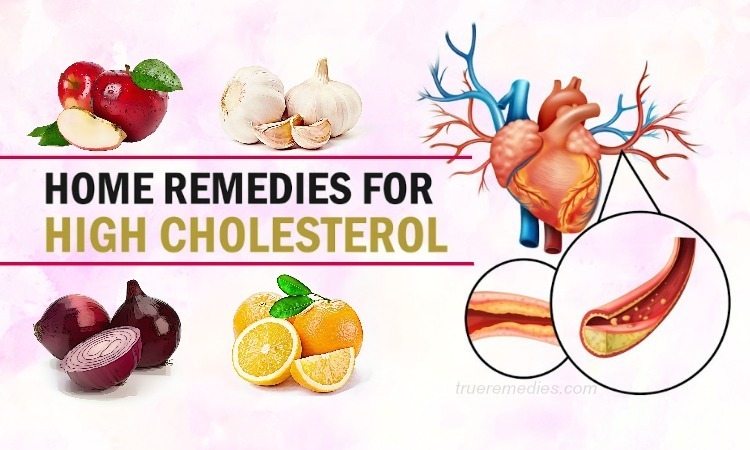 In addition, people with certain conditions such as diabetes, kidney disease, and liver disease or poor body hygiene are at high risk of contracting the disease.You can control this disease by minimizing risk factors. People with some skin conditions that result in scratching and injury to the skin such as scabies or eczema are also prone to boils. Obese people, people with poor nutrition are those at high risk of boils. Please see your doctor for more information. The above is the basic information that you should know about boils. With this information, you are more assured in determining exactly what your situation is. Here are tips to help you get rid of boils fast at home. The options are natural, easy and cost-effective. 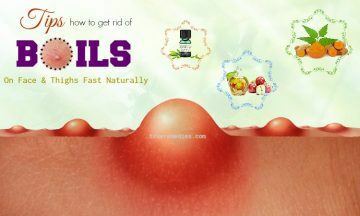 It is time to find out the best tips on how to get rid of boils on face and thighs fast naturally. Take a look at TrueRemedies.com! 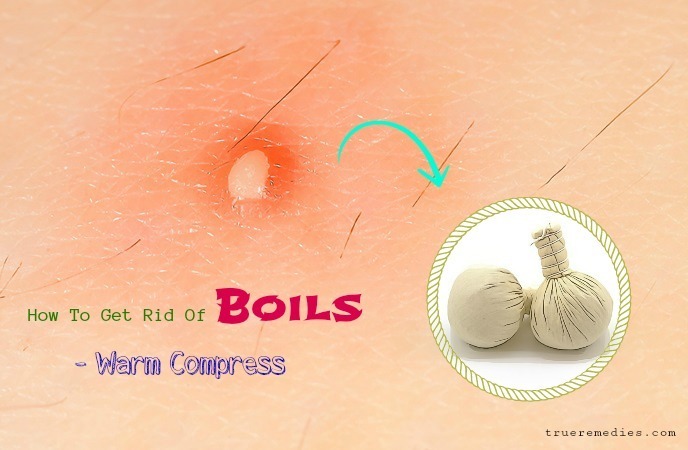 Warm compress is the first treatment in this list of tips on how to get rid of boils fast. You should do this as soon as boils appear. The sooner you start treating your boil, the less risk you will have. Warm compress helps to speed up the healing process. This tip helps regulate blood circulation in the area of boil skin, triggering autoimmune reaction of the body, bringing antibodies and white blood cells into the infected area. The temperature also causes pus to appear on the surface of the skin, allowing the pus to dry quickly. Warmth also helps relieve pain. Therefore, please apply this tip as soon as possible. You need to apply warm even when the pus begins to flow from the boil. The way to do it is very simple. All you need to do is soak a clean towel in hot water, squeeze out the water and apply it to the boil for 5-10 minutes. You can also dip a clean towel into the water and put it in the microwave for 30 to 45 seconds, then apply it to the boil. Even though the microwave oven can also kill bacteria, you should still use a clean towel to do this. Let’s perform this tip 3 to 4 times a day to get the best results. Note that you should not overheat the towel, otherwise the condition may get worse. In addition, you can soak the boil in warm water if possible. Sitting in a warm bath is a helpful way, if you have a boil in the lower body. Among tips on how to get rid of boils fast, this is one of the most effective. Because boils are located on the surface of the skin, besides, they are very thin and pus-filled, so you can easily break them with just a needle. However, you should not break the boil at home as this will cause the boil to become infected or to cause the bacteria in the boil to spread, causing additional boils. This can also cause swelling, infection or scarring. Don’t worry, continue to apply warm and the boil will break itself after about 2 weeks. Using tea tree oil is another must-try treatment in this list of tips on how to get rid of boils fast. Tea tree oil is a natural antibiotic that is often used to treat dermatitis. This oil is extracted from the leaves of Australian tea tree. Tea tree oil helps heal boils because it has anti-inflammatory and antibacterial properties. In addition, the rapid penetration into the skin of tea tree oil is also a highlight of it. In addition, it is also very useful in preventing the production of bacteria when the boil is broken. The method is very simple. All you need to do is use a cotton swab to apply the tea tree oil to boil 3-5 times a day. Tea tree oil can cause allergic reactions to some people (this is very rare), so stop if you notice the skin around the boil is irritated and swollen. Besides, do not allow the oil to come into contact with the eyes as it can cause sharp pain. This tips is one of little – known tips on how to get rid of boils fast. When the boil is broken, dry it with a clean paper towel. Do not be surprised if you see a bit of pus and blood coming out of the boil. The larger the boil, the more blood and pus. After drying the boil, use an antibacterial towel to wipe it gently. Boils are not contagious, but the bacteria inside them can do that. There may be water coming out of the boil for a few hours, so apply some antibiotic cream or lotion to the boil and use gauze to cover it.You can leave overnight. If you do this during the day, you should change the gauze regularly. The next day, let the boil be exposed to the air as it helps to heal faster, but do not let it touch the sunlight for too long.This can cause burns to the affected skin and leave the discolored skin areas for weeks or months.Continue to perform warm compress for a few days after the boil is broken so that the solution inside it can drain out. Besides, you need to always ensure hygiene for boils. Antibiotics are rarely used to treat boils, however, your doctor may prescribe them for you if the inflammation is severe or if it is recurrent for several times.If you have too much boil or if it recurs more than once, your doctor will prescribe antibiotics for 10 to 14 days.In some serious cases, you will have to take 2 types of antibiotics with strong antibiotic ointment to apply on the skin throughout the day. Side effects of antibiotics include killing the “good” bacteria in the intestine, leading to indigestion, diarrhea, stomach cramps and nausea. Allergies, rash and shortness of breath are also related to antibiotics. Over the past several decades, the abuse of antibiotics has created antibiotic resistance. This is a very dangerous situation.Therefore, if you have a boil, consult your doctor before taking antibiotics. The next treatment in this list of tips on how to get rid of boils fastisusing turmeric power. The use of turmeric powder seems to be one of the common skin care remedies for many women. But do you know that turmeric powder can also be used to treat boils? Excellent anti-inflammatory effect is one of the most prominent features of turmeric powder. Turmeric contains a major active ingredient – curcumin. Curcumin has been studied based on clinical certification. Studies have shown that turmeric has potent anti-inflammatory properties. Not only that, turmeric is also known for its ability to filter blood. In addition, it also helps fight cancer cells and protects the liver, kidneys and many parts of the body. The use of this powder also helps to relieve pain very effectively. This is really great! You can use turmeric powder to treat boils from inside and outside the body. Every day, mix 1 teaspoon turmeric powder with 1 cup of warm milk to drink. This works great for the whole body. Besides, it also helps you avoid the risk of scarring. Not only that, you can apply turmeric on boil and then use a gauze to fix it. This helps to speed up the treatment of boils. This sounds strange when it comes to tips on how to get rid of boils fast, but it is very effective. Garlic is a powerful natural antibiotic. Garlic contains more germanium than any other food (germanium is an anti-cancer agent). An other common uses of garlic is to help stabilize blood pressure. However, the most prominent effect of garlic is antibacterial property. This natural antibiotic works against harmful bacteria, viruses and pathogenic fungi.Garlic also contains lots of vitamins and nutrients, including proteins, potassium, vitamins A, B, B2 and C, calcium and zinc. It is not surprising that all these substances in garlic have a very positive effect on our immune system. It is because of this that garlic helps the body against the bacteria and viruses. For that reason, the use of garlic for treating boils is something you should do . Among homemade tips on how to get rid of boils, this is an Ayurvedic treatment. It helps to draw out the toxins, boost blood circulation, soothe skin inflammation and disinfect wounds to eradicate boils. Note: Use garlic capsules as an altnerative for crushed garlic. Turmeric is featured with anti-inflammatory and antibacterial properties, helping to decrease boils, irritation and pain. 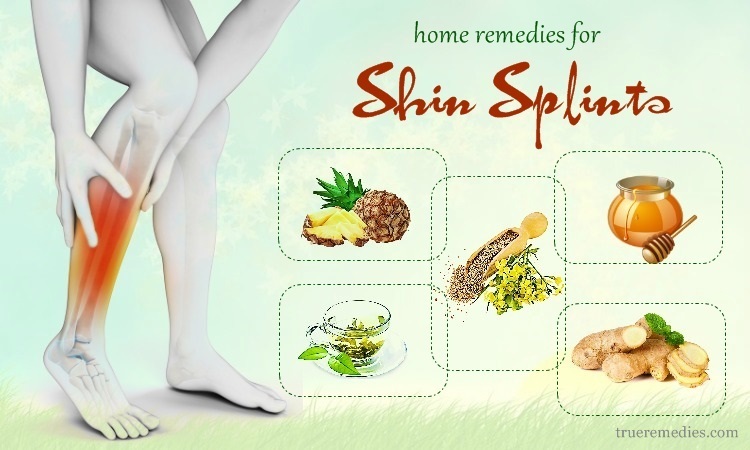 Especially, this method is used to deal with boils on the inner thighs. This ingredient is highly effective when it comes to how to get rid of boils. Using apple cider vinegar is one of the little-known tips on how to get rid of boils naturally. Apple cider vinegar is one of the ingredients that you should not ignore if you want to remove boils quickly. It contains a lot of acetic acid, protein, enzymes, antioxidants, amino acids, K, P, Ca, Mg, Cu, vitamins A, B1, B2, B6, C, and E, bioflavonoid, pectin and many bacteria needed for the body. Apple cider vinegar has strong antibacterial properties, so it can eliminate many types of bacteria and viruses. This naturally fermented vinegar also improves our immune system. All this information contributes to the assertion that apple cider vinegar can help you remove boils quickly . Th way to use apple cider vinegar is very simple. All you need to do is use a cotton swab to apply apple cider vinegar to the boil. If you feel pain after doing so, you can dilute apple cider vinegar with water. Please apply this tip 2-3 times a day to get the results you want. Using castor oil is the next one in this list of tips on how to get rid of boils on face and thighs naturally. Castor oil is used in many natural and medical treatments – including chemotherapy for cancer patients. Castor oil is rich in Ricinoleic acid which has good anti-inflammatory and antimicrobial, anti-fungal, and antiviral properties. In addition, the amount of unsaturated fatty acids in castor oil has antioxidant properties. Therefore, this natural oil is an effective anti-inflammatory agent to reduce swelling and pain in boils. It’s not hard or time consuming, all you need to do is use a cotton swab to apply castor oil to the boil. Besides, you can also use a cotton pad dipped in castor oil and apply it to the boil. Let’s fix it with a bandage. For this method, you should change the cotton pad every 2-3 hours. 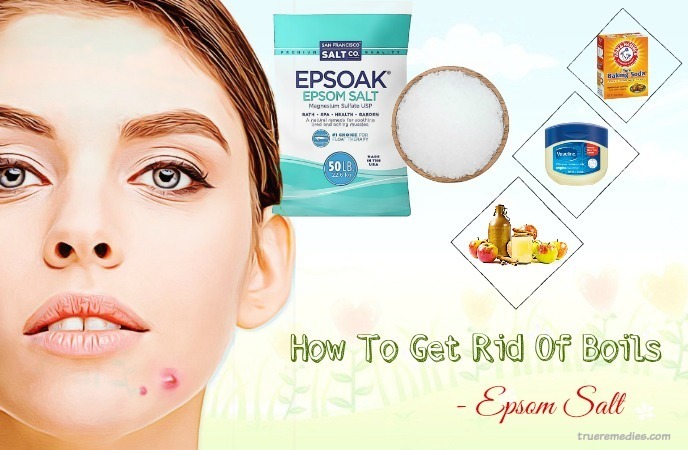 Epsom salt is also called as Magnesium sulfate which great properties for health and beauty. Considered as a drying agent, epsom salt can draw out toxins and reduce pain associated with a boil. Besides, the natural antimicrobial and antisepti properties can help defeat bacteria. Epsom salt also absorbs the boil’s moisture, thereby drying out the boils quickly. It promotes the immune system, preventing skin abscess as well as its recurrence. In addition, its astrigent can draw out the pus along with impurities from boils. The heat which is generated by epsom salt will enhance blood circulation, draw pus to the skin surface, and boost the body to concentrate on your affected area  . Note: You can take advantage of dead sea salt for better results. Method 2: This is suitable for those with open boils. If you use salt regularly, it will not only relax your mind as well as body but also boost the circulatory system for appropriate health. Similar to garlic, onions also have sulfur-containing compounds which possess antimicrobial properties. Furthermore, it has antioxidants and flavonoids, helping to heal as well as protect the human skin  . The essential oils in onions could exhibit some properties like anticoagulant, analgesic, and expectorant properties to prevent boils and their reccurence. 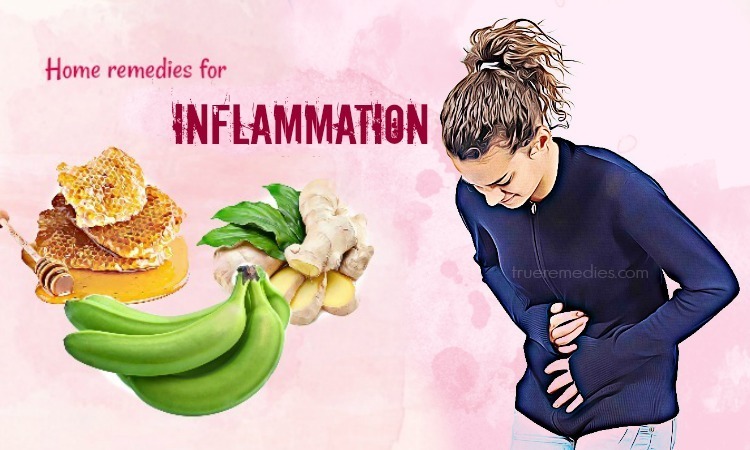 Besides, there are 25 active compounds in onions, including sulfur, potassium salts, quercetin, etc, which help to prevent pain significantly. The red onions can eliminate toxins out of your body and thereby disinfect your wounds. On the other hand, onions also act as an absorbent drawing out bad stuff from your affected areas, lessening pain, and aiding in infection removal. You can also rinse your boils with onion water to bring them to the head and drain them. If boils are in the form of cystic acne, then you can combine onion with honey to get good results. You can also use onion which is cooked in olive oil to apply on the cystic acne, helping to discharge the boil pus. This sounds strange when it comes to tips on how to get rid of boils, but it does work. This poultic will accelerate the boil to drain out its pus, thereby relieving inflamation. Also, it increase blood circulation to heal the issue rapidly. Do not squeeze your boils because it may spread infection. Use the onion freshly, not sweet onions. Avoid consuming more onions in case of getting pregnant or being breastfeeding, having heartburn or using antiplatelet or anticoagulant drugs because it increases your potential risk of bruising or bleeding. This is a succulent plant and its gel has at least 6 differnet antiseptics along with other chemical compounds which have been proven to provide a number of medicinal benefits, particularly when used on the human skin. It contains amino acids and acemannan which could stimulate the recovery, fatty acids and enzymes which act as inflammatory agents, polysaccharides which promotes skin healing process, and glycoproteins which can soothe pain. Not only that, aloe vera gel also has trace amounts of vitamin C and vitamin E. All of these qualities are beneficial for skin health . That is why aloe vera gel is used to treat a variety of conditions, including boils. 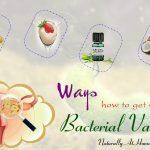 The majority of people recognize that this plant has beneficial properties to cure sunburns, fight parasites, and a lot of other viral and fungal infections. On the human skin, it is used as an anti-inflammatory and antibacterial remedy for some diseases, including arthritis. 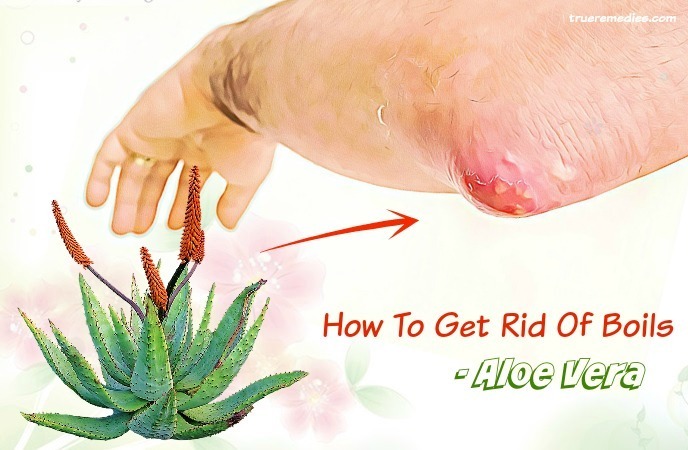 Upon dealing with boils, some aloe vera’s properties come together to treat them. You should use pure aloe vera gel instead of dried or commercial ones because they do not have all pure properties of the raw version. So how long will it take for aloe vera gel to tret boils? Becasue the toxins are flushed out from the affected rea, the boils may look worse before they look better, particularly if they were under skin. Toothpaste is well-known in regard to helping remove annoying pimples, but not many of us know that it also works well for boils. Toothpaste, especially the white type, can absorb moisture from the areas with boils and make them burst more quickly . If you do this method, the boil will ideally burst within one day and heal in the days after. Black seed oil is extracted from black cumin. It has anti-bacterial, anti-inflammatory, and antioxidant properties, improving the skin effectively. It could be consume for the boil treatment. This oil is used widely in the South Asia and Middle East to deal with a lot of health, hair, skin issues. The extensive pharmacological applications of black seed oil include anti-inflammatory and antimicrobial properties. They are all helpful for treating boils . Coconut has numerous benefits, including curing skin outbursts and boils. In details, the monolaurin in coconut oil has been known for its bug-fighting effects. It could protect against some types of bacteria as well as fungi whilst not impacting good bacteria. Its anti-fungal property is used in the treatment of fungal infections, like candida along with other fungi species. The moisturizing property of this essential oil can hydrate your affected area and lessen swelling and inflammation associated with boils. If you decide to use coconut oil to get rid of boils, you should choose the food grade type. Virgin coconut oil is your best choice, particularly if you are considering applying it topically or consuming it. Unrefined coconut oil still retains the most nutritional value upon processing. It is far superior to the refined type. Note: Avoid overheating this oil because it might burn your affected area. Neem, also called as Indian lilac, is scientifically known as the star of Ayurveda, Homoeopathic medicine. It has been used for ages to deal with all kinds of health issues due to its multiple medicinal properties. Most parts of the neem tree are resorted in medicine. Its leaves are highly effective as they have antiulcer, anti-inflammatory and antifungal, antimalarial, antioxidant, antiviral, anti-mutagenic and immune-modulatory properties. 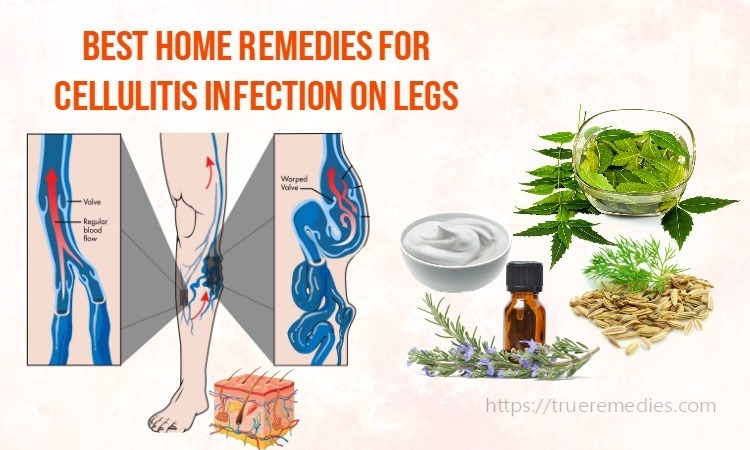 Therefore, it is one of the most powerful home remedies to remove boils and soothe the pain and inflammation associated with it. Moreover, neem leaf paste is very effective in treating pimples and acne  . Potato has natural skin lightening effects, making it a good ingredient for skincare. Raw potato is a common cure for dark circles under eyes. Besides, the high concentration of iron, calcium, magnesium, phosphorus, vitamin C and B complex in potato makes it one of the most effective tips on how to get rid of boils. Flavonoids, alkaloids, tannins of potatoes can improve skin health and relieve many skin related issues. Potatoes also possess anti-inflammatory property, thereby lessening swelling, pain and redness associated with boils. Its alkaline nature makes it one of potent remedies for boils. One of the little-known but effective tips on how to get rid of boils on face and thighs is using Echinacea. It is famous for antiviral, antibacterial and antitumor properties. Thus, it is highly effective for skin diseases including herpes and boils. The Echinacoside compound in this herb can fight off streptococcus and staphylococcus aureus bacteria responsible for boils on skin and many other infections. This compound also boosts the immune power of the human body. Echinacea is available in the form of capsules, powder extract, tea and ointment, which could be used topically or orally. However, you should consult your doctor for the proper dosage in case you want to use it orally. Cumin seeds are used widely as a spice. They are a must in Indian curry. A lot of health and skin benefits of cumin seeds are listed, including drying the boil and draining out the pus forming inside a boil. In addition, these seeds can decrease swelling, pain, redness and inflammation accompanied by boils, making the area soft and smooth. 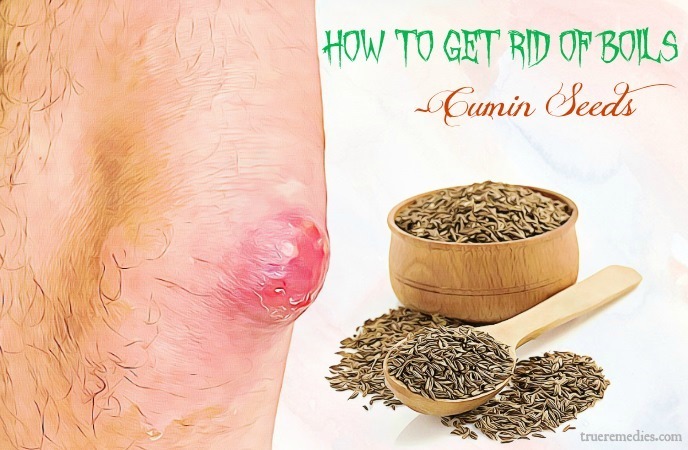 What is more, cumin seeds can prevent the recurrence of boils. Cilantro or parsley is another helpful tip on how to get rid of boils. It has numerous amazing benefits for skin and hair. The antioxidant, antifungal and antibacterial properties of parsley can fight off bacteria which cause boils and also trigger the boil to burst faster while preventing its recurrence. If you use it regularly, it will soothe skin irritation and inflammation accompanied by boils. · As a result, your boils will burst out, then drain the pus. Remove it off with a cotton cloth after several hours. Do not share towels and clothing with patients. Boils are not self-inflicted, but bacteria that cause boils are responsible for the transmission from one person to another. Boils are highly contagious, so you should avoid sharing towels and clothing with patients. These items should be cleaned after use by the paients. Establish good body hygiene habits. Good body care is an important part of helping you prevent or treat boils. Folliculitis is a common cause of boils, so you need to prevent bacteria from accumulating on your skin by bathing every day. Also, wash your hands carefully to prevent spreading this infection to other people. Daily, you can use the bath soap as usual. But when the boil is about to appear on the skin, let’s use bactericidal soap. Besides, you should alos use a bath cotton to bathe. This will prevent excess oil and dirt from stuck in the hair follicles. Immediately cleanse the wound on the skin. bacteria easily penetrate the body through skin lesions. they will move in and focus on the hair follicles, causing infection and developing into boils. To prevent this risk, thoroughly clean each small wound with antibacterial soap. Consult your healthcare provider in case you boils are not cured within 4 days or if your symptoms get worse and are accompanied by other signs like change in appetite, pain in body parts and fever. Above are the tips that we want to introduce to you to help you remove boils quickly. As you can see, they are all very simple, safe and effective. So, do not hesitate, apply them as soon as possible to eliminate the pain that this condition causes. 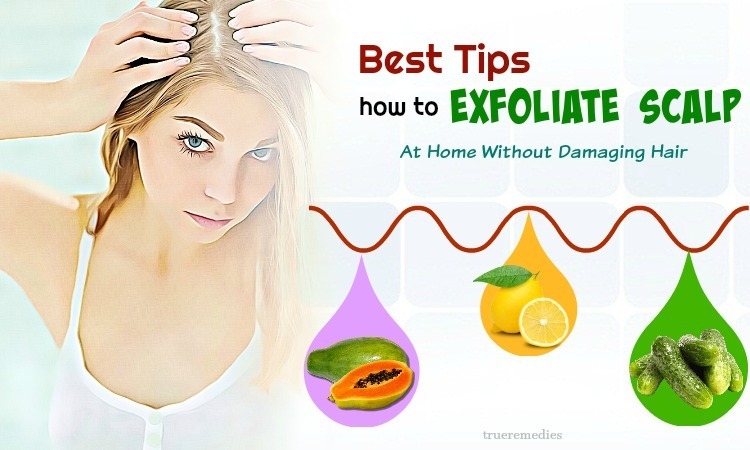 If you have any contributing ideas about our article of “Top 21 Tips On How To Get Rid Of Boils On Face & Thighs Fast Naturally” introduced in How To Category, do not hesitate to drop your words below this post. We will answer as soon as we could.